Update 2 (18. May 2007)! A selection of the photos taken at the workshop is available. You can also browse more detailed galleries for day one, day two and both days. You can now see, download, view and share the slides for the workshop presentations. FRISK Software is holding an Antivirus Testing Workshop in Reykjavik, Iceland, Tuesday 15th and Wednesday 16th May, 2007. The workshop brings together developers of antivirus software and people involved in the comparative testing of such products. The goal is to discuss current “best practice”, common flaws and suggest possible improvements in antivirus testing methods. Antivirus software architects, internal detection testers, malware collection maintainers and people involved in the comparative testing of antivirus software. The registration fee for the International Antivirus Testing Workshop is US$ 400. Deadline for registration is Friday, 13th April 2007. Agenda for the International Antivirus Testing Workshop. Presentations and slides for the International Antivirus Testing Workshop sessions. Abstracts for the International Antivirus Testing Workshop sessions. A taxi between the airport and Hotel Saga, one way, costs around ISK 6,500 during the day and around ISK 9,000 during evenings and weekends. The taxis can be found outside the airport building or can be ordered at the reception of the hotel. The evening will begin with a short sightseeing trip on the way to the world famous Blue Lagoon (www.bluelagoon.com/), Iceland's most unique and popular attraction. 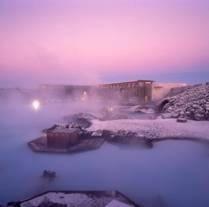 Guests will enjoy bathing and relaxing in Blue Lagoon geothermal seawater, known for its positive effects on the skin. This will be followed by a delicious dinner at the modern Blue Lagoon Restaurant, which has a spectacular view over the lagoon. The Blue Lagoon is about a 40 minute drive from Reykjavik. A coach will be arranged to collect people at the Hotel Saga and return people to the Hotel Saga later in the evening. Price per person: US$ 100. This needs to be pre-booked and can be ordered via the registration form. If your spouse is visiting Iceland with you, he/she is welcome to attend and can also be booked via the registration form. Please note: People need to bring swimming costume and towel or rent them at the Blue Lagoon.